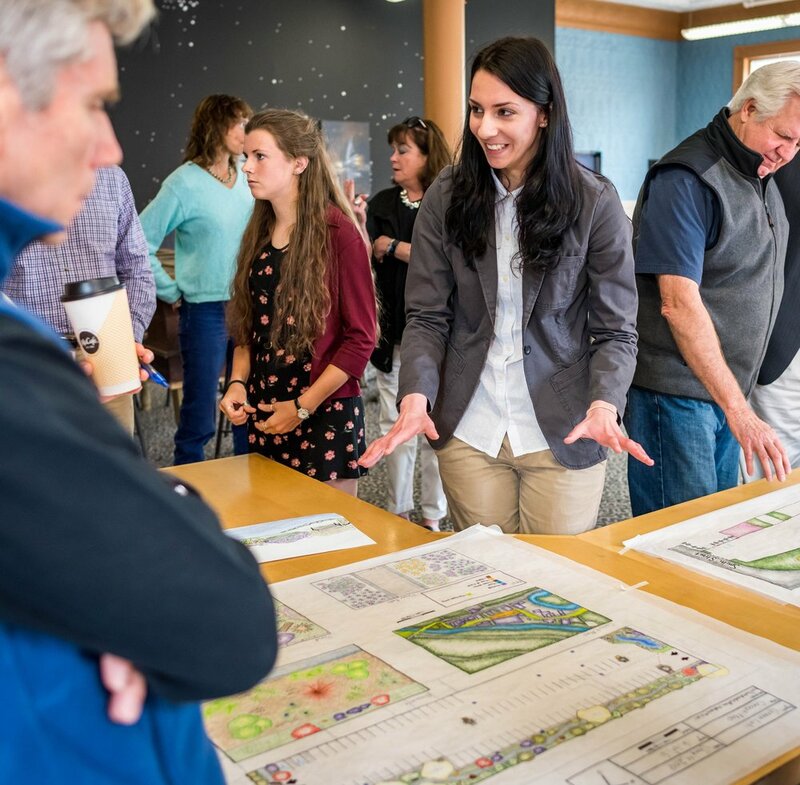 Hands-on learning and transformational experiences are cornerstones of a Colby-Sawyer education, and through the Sustainable Learning Initiative (SLI) at Franklin, more than 280 students have partnered with stakeholders to revitalize the N.H. community. Students’ latest foray into Franklin’s efforts is a four-credit May Intensive that enables students to engage with professionals, improve communication and presentation skills, work on time management, and conduct real-time accelerated research in a setting that replicates a job environment. This past May, graphic design major Erin Chute ’20 and sustainability majors Stephanie Malicki ’18 and Acadia LeBlanc ’19 worked with adjunct faculty member Stacey Doll to develop recommendations for the green infrastructure in the “infield” of the bridge-to-bridge downtown area. Green infrastructure can include green roofs, bioswales, rain gardens, constructed wetlands and green streets. The students’ design process focused on permaculture, the development of agricultural ecosystems intended to be sustainable and self-sufficient. The design plan began with the students identifying and engaging with stakeholders to understand their needs and visions, then developing project goals. They also analyzed and assessed the project site and participants and drew a basemap to provide background detail of the location’s existing boundaries and infrastructure. The trio presented their final design and findings to gather feedback and bolster support for permaculture design in the downtown site. Stakeholders included the city of Franklin, CATCH Neighborhood Housing, Chose Franklin, the Tax Increment Financing Advisory Board, FBIDC, PermaCityLife and Chinburg Properties. They had some questions but supported the design; one participant proclaimed the project a “net gain” for the city. In the fall of 2017, my Publication Design class at Colby-Sawyer had the opportunity to work with PermaCityLife on a project that would help further our understanding and skills of designing publications. For this project, Jenisha Shrestha – the Community Development Assistant from PermaCityLife – presented the idea of designing an Annual Report for the organization. With the appropriate text and professional photography given to us by Jenisha, each student was responsible for designing a comprehensive cover, inside layout, and back cover for this ready-to-print publication. The overall Annual Report layout was to be designed in a way that would encompass the importance of PermaCityLife, and bring out the details and projects of the organization from over the past years. These layouts described who and what the organization is, their mission, what projects they have accomplished, who their project partners are, their awards and recognitions, and projects from the Sustainable Learning Initiative at Franklin Falls. In our first meeting with Jenisha, our professor, Charles Gibson, entertained the idea of including a timeline that would visually represent the past workings of the organization. Agreeing that this would be an important layout to include in the Annual Report, we decided to dedicate as much time in to the timeline as we did with the whole report. Working and learning along with Jenisha and PermaCityLife was a very important and gratifying experience for me as a student and as a designer. Even though I’ve personally had client-based projects in and out of the classroom, this project specifically helped me develop my designer-to-client communication skills and was overall a genuinely fun and rewarding experience. Hannah Clark on the stone wall by CSC’s Center for Art & Design. Before this class, I had no experience in creating any kind of publication layout. During the class, we were given projects based on hypothetical concepts, including a textbook redesign, a magazine cover, and article layout. However, these were hypothetical, and not for any company or client in particular. With this Annual Report project, I was able to conceptualize and design a fully-functioning, comprehendible, and easy-to-read layout for a company that could potentially display my work outside of the classroom. It was an exciting experience; I found myself wanting to work on it in my free time. I really feel as though I put in more time and effort into this client-based project just because of how important client work is to me as a designer. Looking ahead, I believe that this project was one of top reasons for me wanting to become a publication designer. It was a challenging process; starting with only a few pages of text and some logos. There were numerous photographs to sift through and translate the message of, in order to construct a full body of work to be printed, folded, stapled, and ready to read. The message of the organization needed to be clear throughout the designs, not just the text. I feel more confident in my ability as a publication designer, and I am proud of having been able to encompass the overarching theme of partnership, cooperation, movement, and livelihood throughout my design of the Annual Report. As a senior at Colby-Sawyer College, it was important for me to be able to work through processes like this and work comfortably with clients. I feel this experience has given me an extra boost of motivation and I look forward to what lies ahead for both me and the college. The engagement Colby-Sawyer has with clients like PermaCityLife, through the Sustainable Learning Initiative, provides a really great opportunity for students in all majors. I am thankful for what this collaboration has taught me and how I can apply this to my designs and projects with future clients. Hannah Clark with the poster she designed for the senior art exhibition for graduating Studio Art and Graphic Design majors in the spring of 2018. During my third year of study at Colby-Sawyer College, 2014-15, I enrolled in the annual Third-Year Community Based Research Project, a course tailored specifically to junior Environmental Science and Studies program majors. Prior to enrolling in this course, the bulk of my undergraduate studies consisted of learning via traditional lecture and classroom discussion, with little exposure to any “hands-on” learning. The third-year project really presented itself as the first – and ultimately the most fulfilling – opportunity I had to engage in learning through a practice-based approach. Together with fellow environmental classmates, the project that I participated in was dedicated to commencement of the Franklin revitalization efforts, which came to fruition over the course of that year. Julius’ Community-Based Research (“third-year”) class in Franklin, NH with Professor Harvey Pine and Todd Workman of PermaCityLife. When I first arrived in Franklin, NH, I recall meeting with Todd Workman (the present Executive Director of PermaCityLife), who immediately propagated the idea that Franklin was a blank canvas with untapped potential. Yes, Franklin was a struggling city with an economically depressed downtown. Todd declared that the depression could be shaken through innovative intervention. From the start, Todd encouraged us to delve into creative thinking, with the intention of developing a shared vision for the transformation of the downtown. Putting financial practicality and the possibility of implementation aside, what did we, as individuals and as a group of millennials, think constitutes a sustainable and vibrant city center? I believe that some of the preliminary exercises that Todd conducted generated a significant amount of excitement for the project, and students were not only quick to conceive ideas, but were also eager to proceed to the next phase of designing strategies for the realization of such ideas. Initially, the objective of the third-year research project was to compile a list of recommendations that would inform the municipality’s 2014 update to the city’s Master Plan. Some of the most important sections of the Master Plan include the vision statement and the status of economic development. While our group provided recommendations to the city in each of these areas, it also consulted and represented the forthcoming nonprofit, PermaCityLife. As a student researcher for the Franklin Falls revitalization initiative, spearheaded by PermaCityLife, I had the opportunity to collaborate with municipal leaders and local agencies to not only draft proposals for recommended action, but to also carry out their implementation. Working with the City of Franklin and PermaCityLife during my junior year allowed me to apply classroom learning to what evolved into a professional consulting experience. The third-year project provided me with an ecology-like glimpse into the nature of the interactions that occur between the public, private, and nonprofit sectors. My experiences in Franklin taught me, quite literally, how to be an advocate for whole systems sustainability; a system comprised of social welfare, personal wellbeing, economic vitality, and ecological integrity. The main takeaway from the project is that progress is a product of compromise between two or more entities, in which respective costs and benefits are closely analyzed and reconciled. What was humbling to me is how stakeholders in Franklin were able to come together to create change for a positive, environmentally and economically cohesive future. Certain governments have brought environmentalism to the forefront of political consciousness, while others have deliberately given preference to economic interests at the expense of the environment. My educational experiences, led by those in Franklin, have highlighted how governments and their legislation can effect change, and how laws, policies, and innovative solutions can be crucial determinants in the emergence of a transformed culture, wherein economies and the natural world flourish together. The class meeting with various stakeholders in the town. I am now attending the University of Connecticut School of Law because I am committed to furthering the development of environmental and energy policy through the legal process. I see great purpose in pursuing a Juris Doctor, as it will provide me with the skill set that I need to address some of the greatest policy challenges of the 21st century, including those combating climate change. Through my work and personal experiences, I have witnessed the devastation that the lack of environmental regulation has caused in our world, and I worry about the future. As someone who is privileged enough to possess this knowledge, I see no other option than to direct my resources and energy into fighting for environmental change. I am prepared to change both the policies and culture that drive environmental exploitation, and to build upon the progress that’s already been made. In Fall 2016 Colby-Sawyer Students in Professor Hilary Walrod's Identity System Design class and Professor Stacey Watts' Senior Seminar in Sport Management class visited Franklin, NH to meet with their community project partners. Photo by Jenisha Shrestha. Last semester, my Identity System Design class worked with the Mill City Park initiative. We spent the first half of our semester working on separate, practice systems to familiarize ourselves with the design process and then met with our community client. Mill City Park is a project under development that plans on adding a bunch of outdoor recreation features to Franklin, NH, including mountain biking trails, pump tracks (another biking thing, in case you've never heard of that like I hadn't), a whitewater park, and a community garden. They are focused on the outdoors, being active, and participating in the community, but the project also wants to link itself to the town's storied history. And since it's an industrial town, there's not much overlap between that and the other values the park wants to embody. Reconciling that was our big design challenge. Speaking of design challenges, working with an actual client is humbling when all your prior work has been theoretical. The goal is different — instead of optimizing for the execution of the ideas you bring to class, you have to work with what the client brings and put aside a lot of the vision you have for the project (which is the last thing an art student wants to do). After mostly bringing our own cards to the proverbial table for three plus years, it was jarring to have them dealt to us by an organization we had zero familiarity with. Even though our client ended up picking my logo as the jumping off point for their identity system, I probably had the most trouble out of anyone in my class with that adjustment. Our client wanted to draw on Franklin's past, but I wanted to paint a picture of its future — and after spending too much time trying to reframe the project so it worked the way I wanted it to, I learned that I could fulfill our client's vision without throwing away my design-minded priorities. Compromise like that takes a different kind of creativity than schools tend to teach. Recognizing that we lacked it, and that we needed to learn it for this project, showed us right away how it's going to be an important skill for our post-graduate careers. Each student in the class made hundreds of sketches and drafts before settling on a final design to enter in the competition. The center image is Justin Rand's winning logo that was selected by Mill City Park. Realizing this was especially humbling for me: after hours of research and hundreds of sketches, I got the honor of being the only one to have every single one of my concepts rejected by the client at our mid-process meeting. I was forced to switch gears — from trying to use good design on my own ideas to convince the client to want something they hadn't asked for, to accepting the parameters we were given and doing my best work within them. Turns out, swimming with the needs they dropped on us instead of against them makes progress a lot easier, and going all-in on what our client was asking for got my design chosen. Despite how I had to basically start over halfway through. I think everyone in the class saw that and took note of it — even though only one of us got to pat ourselves on the back for having our work chosen, we all learned the same lessons about how to apply these skills we've accumulated during our education. Looking ahead at my own career, the Mill City Park identity project has been more than a chance to face reality and learn: I've been able to turn my success with them into freelancing and other resumé-padding opportunities with other related organizations in Franklin. That's one of the big reasons I'd encourage Colby-Sawyer to keep scouting out opportunities like this for students — even though us art students like to think our fields are pure, sacred meritocracies, the reality is that just like other jobs, networking is a crucial part of being successful, and we should practice that skill as much as we can. Owen Krol '17, Nick Dibble '17 and Rayla Putnam '16 perform water quality analyses in the Winnipesaukee, Pemigewasset and Merrimack rivers for their community partner Mill City Park, as part of Professor Nick Baer's Aquatic Ecology class. Photo by Chris Kontoes. At the end of last semester Colby-Sawyer College and PermaCityLife (PCL) celebrated the opening of The Hub for projects and partnerships at 357 Central Street in Franklin. This downtown space is the homebase for PCL, as well as the new field studies office for CSC's Sustainable Learning Initiative at Franklin Falls and our innovative 3-year community-based sustainability major. Professor of Natural Sciences Nick Baer’s Aquatic Ecology students conducted analyses of aquatic life to assess water quality prior to the in-river modification and restoration for the park. The design for a new community garden in Franklin was developed by Professor of Environmental Studies Leon-C Malan’s Sustainable Food System class. The college’s entrepreneurial business club, Enactus, authored a comprehensive business plan for the Twin Rivers Interfaith Food Pantry. Two students in Professor of Business Administration Jonathan McCosh’s Advertising and Social Media class outlined a preliminary communications plan for PermaCityLife and SLI. And, senior Capstone research projects included a riparian invasive species inventory for the park, social sustainability research for CATCH Housing and website graphic design for Take Root Coworking. Welcome to The Hub--home of the Sustainable Learning Initiative at Franklin Falls.